GLOBAL wool demand and supply continues to be in growers’ favour, despite world economic condition concerns. In wool auctions across Australia last week, the benchmark AWEX Eastern Market Indicator lifted 13 cents to 1923c/kg clean, and brokers passed in 6.7 percent of the 51,703 bales listed in the largest national offering since April last year. Global wool analyst Chris Wilcox, from Poimena Analysis, said crossbred wools have been doing very well in the past two weeks despite the volumes available, whereas Merino wool demand is not strong “either way”. Mr Wilcox said current wool price levels reflect concern about world economic conditions, the Chinese economy slowdown and Brexit negotiations and signs of potential softness in retail sales, while raw wool supply is very constrained. Major Chinese processor Red Sun is trying to secure supply for its new combing mill as are other mills, he said. There was probably excess capacity in worsted wool spinning and combing in China. “And with that excess capacity, of course, they are fighting tooth and nail to supply it. Another factor in wool demand has been the Chinese Government’s reduction in interest rates for small companies last week to lift the slowing economy. AWEX senior market analyst Lionel Plunkett said despite the large amounts of wool for sale over the past two weeks, the overall national quantity is still well down on the previous season. “When compared to the corresponding sale of 2018, the total amount of bales offered at auction is down by 175,524 bales, a reduction of 16.8pc.” he said. Mr Plunkett said Merino fleece market was mixed in its performance last week. “The three centres behaved slightly differently, with varied positive and negative movements recorded across the board. “Although there was an inconsistent pattern, the overall trend was upward,” he said. 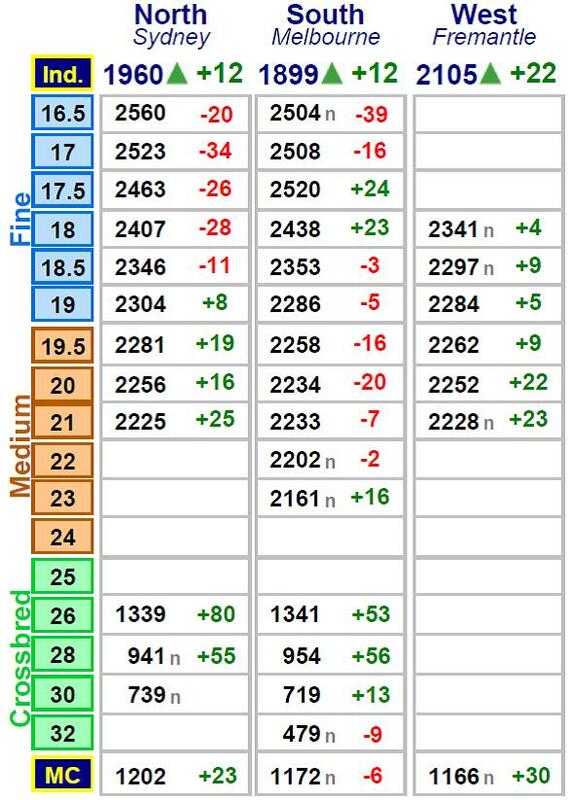 Skirtings managed to record upward movements, generally between 20 and 40 cents, but wools coarser than 19 micron attracted the most attention and as a result enjoyed the largest gains. “The crossbreds were the best performing sector for the week, large gains of 50 to 80 cents were experienced in the 26 to 28 micron range. “Similar to the fleece, the results in the oddments varied between centres, the north and west recorded 20 to 30 cent rises, whilst the south posted a small reduction but again the overall trend was positive,” he said. “Despite the strong market the national offering reduces next week. “Most of the wool is from sheep shorn in recent weeks, as the backlog of wool delivered during the break has mostly been cleared,” Mr Plunkett said. About 41,500 bales are listed to be sold in Sydney, Melbourne and Fremantle this week. 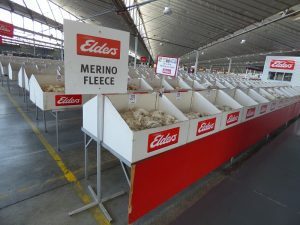 Australian Wool Innovation’s weekly market report said large volumes of drought-affected superfine (under 18.5 micron) Merino wools somewhat hampered the upward progress of that category and prices came off the boil there. “Speculation is that supply concerns are currently the primary driving force of the market, despite the two very large sales that have commenced the New Year, which has presented almost 100,000 bales to the trade. “Locally stored wool stocks are described as being at minimum levels,” AWI said. “What is perhaps the most telling factor affecting the auctions is the strength re-emerging of the bigger local trading companies who have been more willing to take on the Chinese indent operators and orders since the start of the New Year. “Whilst it hasn’t really converted into greater volumes purchased or percentage of the available wools, the price levels have certainly benefitted from their stronger competition,” AWI said. AWI said while AWTA figures are showing an overall reduction of 12pc in the national wool clip, the volume of Merino wool in the superfine category has actually increased from year to year. AWI said a variety of reasons have been presented for the 100 cent-plus gains in 25-28 micron crossbred wool since Christmas. “But primarily, Australia is still the major global source of these wools in the “good white” category. “At the other end of the wool market, the carding wools of all descriptions have come under competition pressure from the start of the calendar year and prices are slowly pushing upward. “We are half way through the winter sales in the Northern Hemisphere and after a sluggish start to retail sales, consumer buying has shown signs of improvement,” AWI said. “That positivity, in an otherwise uncertain environment at present, is welcomed and the cheaper end of the market is recognizing the improving situation as garment manufacturers are clearing stocks, albeit at some rumoured losses. This week’s offering is well down on the previous fortnight roster of around 50,000 weekly, so good competition should see the levels maintained at least, AWI said. Sources: AWI, AWEX, Poimena Analysis.